I am very happy to announce a new five day Therapeutic Yoga training, a collaborative effort with Mary Elizabeth Sheehan of Yoga Potential, Ft. Worth, Texas. If you are a yoga studio, a retreat center, or a holistic center anywhere in the world, we will come to you — no destination is too far! Contact either of us for more information. 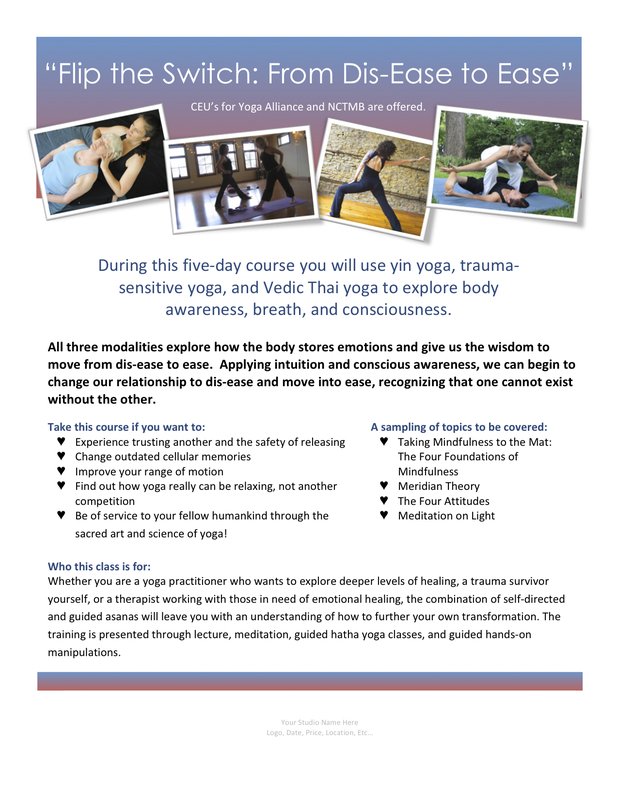 This is an extraordinary training that combines three somatic modalites of yin yoga, trauma sensitive yoga, and Vedic Thai Yoga. Yoga connects! Mary Elizabeth is a long-time reader of this blog and we finally met this summer. Our energies and philosophies about yoga and healing clicked and after receiving Vedic Thai Yoga from her — and for those of you in the DFW area, Mary Elizabeth is an awesome practitioner — we decided to combine our modalities. We firmly believe that these complementary modalities are very much needed in the world today. Both of us would love to bring this healing to populations that can not get this unique training in their area. This five day training will also be part of my Yoga and Spirituality Tour in the Himalayas to take place in March 2013. The training will be an option to the 10 day package. Stay tuned for details in 2012 — yoga studios who host my workshops in 2012 will receive “early bird” information regarding this tour. Have yoga, will travel — contact us! Yoga also HEALS, and that is what this workshop is all about. We aren’t saying you’ll walk out pain-free or sorrow-free, but you will be exposed to three amazing modalities that, through conscious practice, can change your life. I feel safe in speaking for Linda when I say that these modalities that we currently offer have changed our lives. Well, I don’t know if you still plan to come to Nova Scotia some day to teach, but this looks great. Are there any books you recommend about trauma-sensitive yoga? yes, Grace, I am sending that email before I leave for India. and the book I used for my training was “Overcoming Trauma Through Yoga” by David Emerson. Feel free to email me if you need any help or have questions.